Leaving at around 8am, and from an altitude of 3440m, we headed off towards our next overnight stop, Deboche. Deboche is at 3820m. We had not gone 2km, and as we rounded a corner, there was Everest in full view! We were all extremely excited to get our first view of the hill. (As mountaineers refer to it!) We also had spectacular views of the Lhotse face and Ama Dablam. 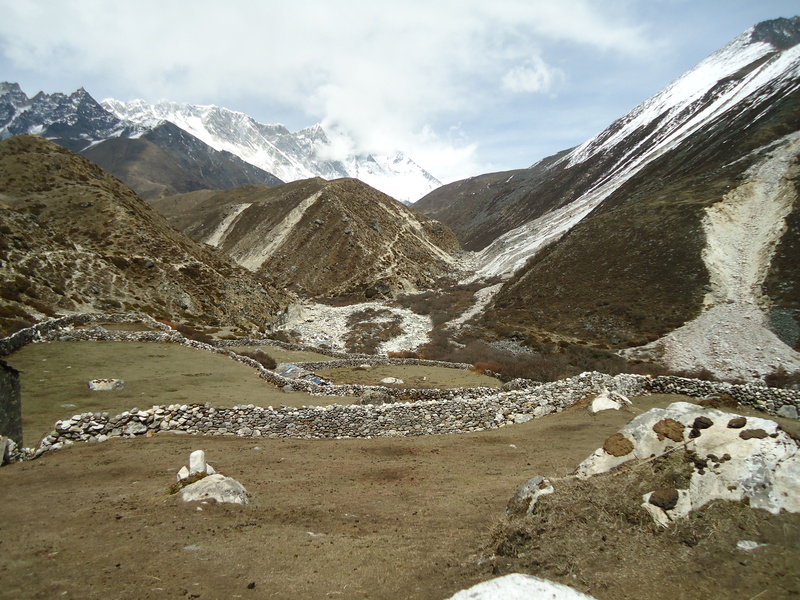 On we trekked, passing a few remote villages, but again the scenery was spectacular. Lunch at a tea house next to a river and then a huge haul up to the Tengboche Monastery. It was not easy and I spend my time concentrating on my breathing in order to get as much oxygen in to the system. The first effects of the altitude would begin to take effect and I needed to ensure that I was not nailed. This meant drinking a lot, eating when you can, and walking very slowly. Breathing is particularly important. After a 2 hour haul to the top, we came out at Tengboche Monastery. It is one of the most important monasteries in Nepal and situated on a ridge overlooking the valley we had come up, and the village of Deboche. It also had a great view of Everest. We spend some time looking around the Monastery after which we headed down the hill to our overnight stop in Deboche. Just as we headed off, it started to snow lightly. At the tea house, we checked in and had our compulsory cup of tea! Next up was the Himalayan Boulle Championships. Sean, Andrew, Reece and I played boulle for an hour or so. We were all in hysterics, including the Sherpa’s and porters. A great way to end the day. Dinner and entertainment put on by Sean and Nico. Stories of their mountaineering exploits on mountains all over the world! .Then early to bed! We left Deboche and followed the contour path through the Rhododendron forest, stunning trees which made us feel as if we were in Avatar! A huge river made its way down over boulders of rapids and waterfalls. We crossed the river by suspension bridge quite a few times. Spectacular scenery and the camera was working overtime! Then the climb commenced and we left the forests behind us and entered into a scrub type landscape, high up overlooking the river. Lunch was had at an isolated tea house perched high up above the river. Below us were stone farm houses, which looked as if they were built in the Middle Ages. From there it was a 2 hour hike down to Dingboche, following a ridge which was very exposed and at times, scary! 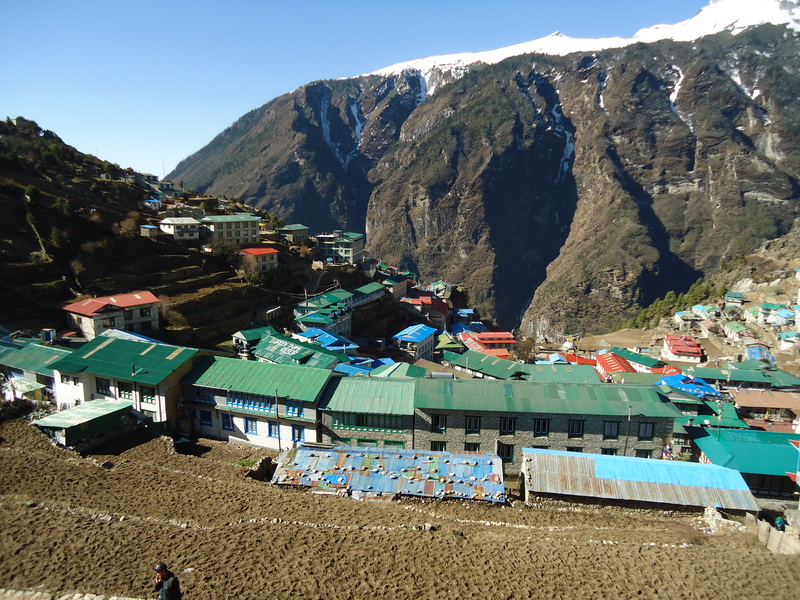 The village of Dingboche consists of a few tea houses and a few tents. Nothing else. Why people stay here, I have no idea! All it caters for is passing trekkers. The plan was to spend 2 days here, with an acclimatization day. 5th April – Easter Sunday! Next morning, we were geared up and ready. Just behind the village is a hill. The plan was for us to climb up to 5100m and then returning to Dingboche. “Climb high, sleep low” as the saying goes. All whilst our bodies build up more red blood cells to get that oxygen around the body quicker! I must admit, I was a bit nervous with regards to how I would acclimatize. I had done Mt Kilimanjaro twice and both times suffered from the effects of altitude!! There are a few ways to combat the effects. Drink a lot, eat regularly and breathe efficiently. We set off and I got in to a good rhythm with Sean setting a slow regular pace. It was a steep climb, not easy, but after some 3 hours or so, we reached the top. 5100meters! And I was in great shape. Certainly a confidence booster for the days to come. Island Peak sits at 6100m, a further 1km vertically still to climb! The view was unreal! The glaciers below and mountain peaks surrounded us. Very special! After a few photos and a chat, we turned for home. Must have taken us less than an hour to get down. With temps now hovering around 0, we got warmly dressed and headed off to…. Wait for it… the French Bakery! A cuppa coffee and a slice of cake. Outside we could see more expeditions and trekkers making their way in to Deboche. ← The trek to Base Camp begins! I am loving following your trip. The stories and photos are awesome. Keep us updated as you go. Keep going strong, may GOD give you the strength calmness over the days to come to achieve your ultimate goal by summiting as always wanted. We are all praying for your safe return to your loved ones.